The 100 greatest insults from film in one clip. Animator and filmmaker Patrick Boivin recently created his short film AT-AT Day Afternoon after a childhood dream of pet Imperial Walker. Patrick started his career writing comic books but realized film is a better way to convey his stories. His short films have won many awards, including selection in the Montreal World Film Festival and Commonwealth Film Festival. More short films from Patrick Boivin on page two. 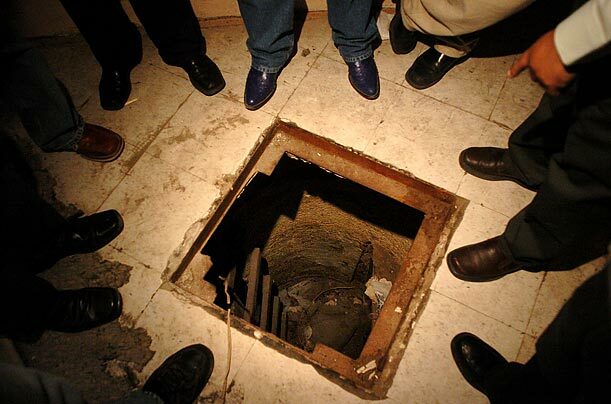 Since 2001, US law enforcement has discovered more than 100 tunnels along the border with Mexico. Did Led Zeppelin Rip Off a Folk Singer? Led Zeppelin must have been a little "Dazed and Confused" when it recorded the classic by the same name 41 years ago -- because it sounds just like a folk song -- so says the folk singer who's now suing Zep's guitarist, Jimmy Page. According to the Federal lawsuit obtained by TMZ, Jake Holmes says he snagged a copyright for "Dazed and Confused" in 1967, two years before Zeppelin recorded its version that sounds suspiciously similar. Could it be -- Zep ripped off a folk singer? Listen to Holmes' 1967 recording. Now take a listen to Zep's 1969 version. The verses are different, but the music's a dead ringer. Here's the good news for Page. Even if a court decides Page ripped off Holmes, the folk singer can only sue for damages from the last 3 years, because of that pesky statute of limitations. As for why Holmes waited so long to sue ... who knows? His attorney had no comment. ​UPDATE: Police have released a transcript of the mom's 911 call. The British Columbia family was on vacation when something horrible happened. When police arrived, the 29-year-old father was sitting on the front porch of the Lake Cushman home (pictured at right). He told them his five-year-old daughter was inside, dead. And that it was he who'd slashed her throat after she'd made him upset. Video after the jump. UPDATE: Peter James Wilson allegedly admitted to police that he killed his daughter, Clare Louise Shelswell, with a kitchen knife. According to police, Wilson told them he was having an argument with his wife about punishing one of their kids. He told her not to worry and that he'd "take care of it." Wilson then apparently took the girl downstairs. When she heard screaming, his wife came down to find her daughter holding her throat in a pool of blood. He's been booked into the Mason County Jail for investigation of first-degree murder and is currently being held on $3 million bail. UPDATE: Wife and mother Sarah Wilson is a nurse, but even she couldn't do anything to help save her daughter's life. Warning: If you're a little squeamish, just the thought of what this mom is going through might be enough to make you feel sick. Or just overwhelmingly sad. Wilson:"My daughter's throat has just been cut. I need you to come right now! I can't stop the bleeding." 911 operator: "OK, what's the address?" Wilson: "I don't know. Near Cushman Lake. I don't know! I don't know where!" 911 operator: "Ma'am, you need to calm down and give me an address, or we can't come." Wilson: "North Cushman Lake- she's bleeding so much, I can't stop it. Oh, my God! Oh, my God...Oh my God, my baby." 911 operator: "Keep pressure on it, please." Wilson: "You have to come right now." 911 operator: "Ma'am, we're getting people en route right now, OK? ... Hang on. We're dispatching the fire department right now." Wilson: (panting) "You have to come now, please." 911 operator: "Ma'am, they are. Please keep pressure on that wound. Don't take anything off of it." Wilson: "Oh, my God, please. I don't think she's breathing." Wilson tried to calm down enough to explain to the 911 operator what had just happened. 911 operator: "How did this happen?" Wilson: "My husband took a knife to her throat." 911 operator: "Your husb- purposely?" 911 operator: "Where is he now?" Wilson: "He's here, but he's away from her." 911 operator: "Does he still have the weapon, ma'am?" Wilson: "No, he does not." 911 operator: "OK, where is the weapon?" Wilson: "It's on the floor in the kitchen - where I am, not where he is." 911 operator: "OK, where is he in the house?" Wilson: "He's sitting in the next room, but he's pretty docile right now." 911 operator: "OK, why is he so docile?" Wilson: "Probably because he's in shock over what he just did." Wilson: "She is not breathing." 911 operator: "OK, then you're going to get her some air. Is there anybody else there who can hold that bandage on while you tilt the head back and give her CPR?" Wilson: "Yeah, but I'm going to have to keep the phone down." 911 operator: "OK, just keep it as close to you as you can, and let me know what's going on." Wilson: "Nothing is getting through to her chest. When I breathe through her mouth, it is all exiting out through the gash in her throat." Thanks to a pair of knockout fake trailers, a team of Finnish filmmakers will soon start shooting an outlandish sci-fi Nazi movie financed in part by fans who flipped over the clips. The first teaser for Iron Sky , embedded below, has pulled more than 1.3 million YouTube views since its release two years ago. The follow-up clip (above), released last month, continued the momentum as the project’s website harvested micro-investments from 52 fans enticed by the spooky-sleek visuals. The trailers also generated buzz on the strength of the bizarrely original Iron Sky premise: During the closing days of World War II, Nazis in flying saucers escaped to the moon. In 2018, they plan a victorious return to Earth. The device will be available to customers in January, according to the people, who declined to be named because the information isn’t public. Natalie Kerris, an Apple spokeswoman, and Jeffrey Nelson, a Verizon Wireless spokesman, declined to comment. Verizon Wireless, which is building a high-speed fourth- generation network, plans to unveil several devices that will run on the new technology in January at the Consumer Electronics Show, Chief Executive Officer Lowell McAdam has said. Verizon Communications Inc., which co-owns the wireless company with Vodafone Group Plc, slid 9 cents to $28.62 in New York Stock Exchange composite trading at 4 p.m. AT&T fell 49 cents to $24.46. Apple, based in Cupertino, California, dropped $12.13 to $256.17 on the Nasdaq Stock Market. Peter Thonis, a spokesman for Verizon Communications, and Mark Siegel, an AT&T spokesman, declined to comment. Tenille Kennedy, a spokeswoman for Research in Motion Ltd., didn’t return a call seeking comment. The iPhone has helped AT&T add subscribers even as the U.S. mobile-phone market nears saturation. There are enough wireless devices for more than nine out of 10 people, according to the CTIA wireless industry association. In the first three months of this year, about a third of AT&T’s iPhone activations came from customers who were new to the carrier. Without those 900,000 new subscribers, the company may have posted a loss in contract customers that quarter, analysts said. Still, Dallas-based AT&T has battled customer complaints about its wireless service, especially in New York and San Francisco, and dedicated an extra $2 billion to upgrading its network this year. For Apple, a partnership with Basking Ridge, New Jersey- based Verizon Wireless is a victory over rivals such as RIM and Motorola Inc., whose smartphones are currently promoted by the carrier. Motorola, which makes Droid phones that use Google Inc.’s Android operating system, fell 27 cents, or 3.8 percent, to $6.80 on the New York Stock Exchange. Google dropped $17.82, or 3.8 percent, to $454.26 on the Nasdaq. RIM, maker of the BlackBerry, declined $3.22, or 6.1 percent, to $49.75. Apple has sold more than 50 million iPhones since the phone’s introduction in 2007. The latest version, iPhone 4, sold more than 1.7 million units in the first three days after its June 24 debut, a record for the product. Chief Executive Officer Steve Jobs said the company didn’t have enough supply to meet demand. Many stores, including retailer Best Buy Co., sold out. A release at Verizon in the first quarter will help Apple’s sales in the U.S. grow to at least 15 million units next year from 11 million in 2010, Barclays Capital analysts said in a note today. The company’s suppliers have been ramping up production of components for a phone on Verizon’s CDMA network, according to the research report.